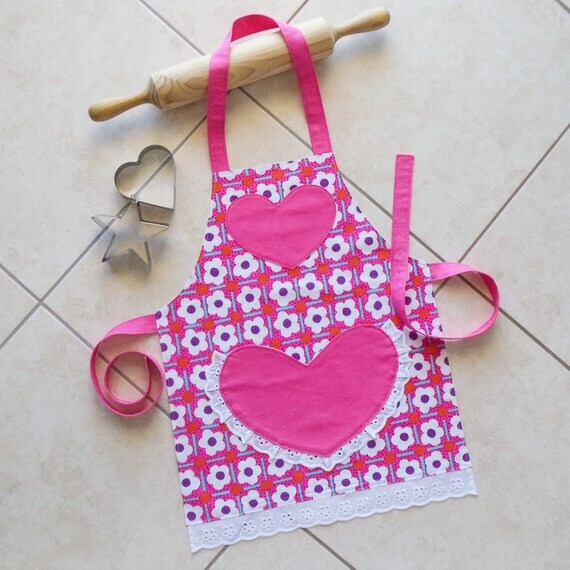 Spoil your budding chef with these pretty kid’s aprons. Perfect for little girls who adore all things “pink”. Made from quality, fully washable, light weight 100% cotton fabric and lined in white cotton. The fabric is pre-washed and seams are top stitched for extra durability. They come in white daisies on a patterned pink background for main body and bright pink for pocket, applique and ties. I have added a subtle splash of Broderie Anglaise lace for that extra “sweet girlie” touch and a little applique heart on the bib. Have a handy lined “Heart” shaped pocket for all those kitchen utensils. Tied at the back with extra long ties, they will easily fit 5 – 9 year olds. 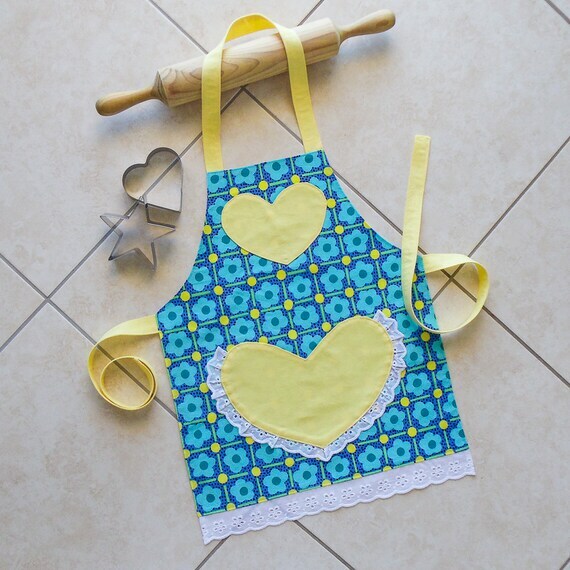 Kids Apron blue yellow, girls kitchen craft art play apron, childs cotton lined apron with heart pocket, kids cute daisy flowers print apron. Spoil your budding chef or artist with these colorful kid’s aprons. Made from quality fully washable lightweight 100% cotton fabric and lined in white cotton. The fabric is pre-washed and seams are top stitched for extra durability. They come in turquoise daisies on a patterned blue background for main body and lemon yellow for pocket, applique and ties. I have added a subtle splash of Broderie Anglaise lace for that extra “sweet girlie” touch and a little applique heart on the bib. If you want a different size please drop me a note via Conversations. 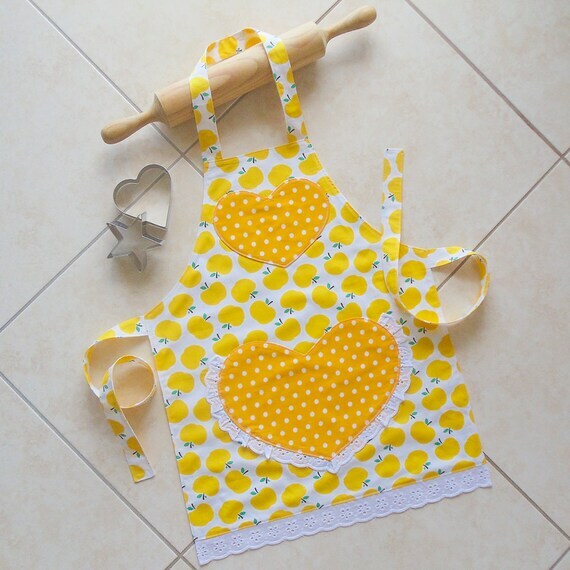 Kids/Toddlers Apron yellow, girls kitchen craft art play apron, childs lined cotton apron & lace heart pocket, yellow apples and polka dots. Made from quality fully washable light weight 100% cotton fabric and lined in white cotton. The fabric is pre-washed and seams are top stitched for durability. They come in yellow apples on a white background for main body and white spots on a bright yellow background for pocket & applique. I have added Broderie Anglaise lace for that extra “sweet girlie” look. Also have a lined heart shaped pocket with a little applique heart on the bib. With extra-long ties they come in two sizes ranges to easily fit 2 – 5 year olds and 6 – 11 year olds. 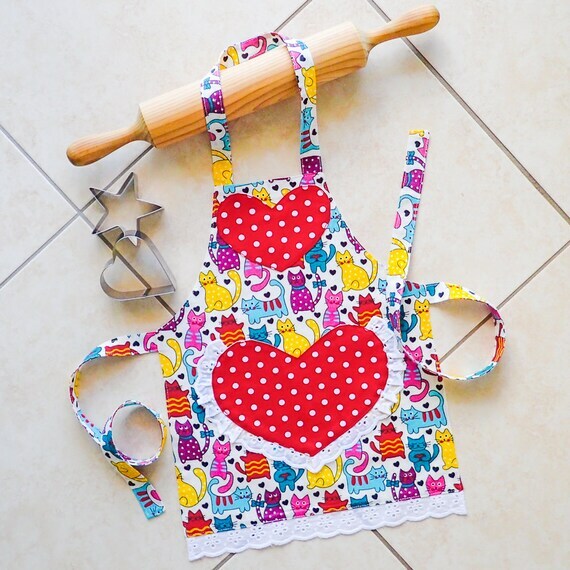 Kids & Toddlers Apron Cats, girls kitchen craft art play apron, cats and polka dots on red hearts, childs lined cotton apron with heart pocket. Spoil your budding chef with these colorful kid’s aprons. Perfect as a craft or kitchen apron for little girls who adore cats. Made from quality fully washable light weight 100% cotton fabric & lined in white cotton. The fabric is pre-washed & seams are top stitched for durability. They have white spots on a red background for pocket & applique, & jazzy cats ‘n’ hearts for main body. I have added Broderie Anglaise lace for that extra “sweet girlie” look. The heart shaped pocket is lined and there is also a little applique heart on the bib. Tied at the back with extra-long ties, they will easily fit 2 – 5 year olds. 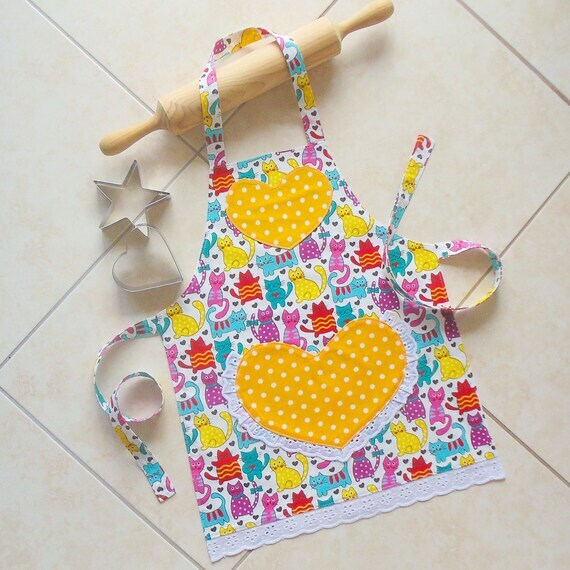 Kids/Toddlers Apron Cats, girls kitchen craft art play apron, cats & polka dots on yellow hearts, child lined cotton apron with heart pocket. They have white spots on a yellow background for pocket & applique, & jazzy cats ‘n’ hearts for main body. I have added Broderie Anglaise lace for that extra “sweet girlie” look. Also have a lined heart shaped pocket with a little applique heart on the bib. With extra-long ties they come in two sizes ranges to easily fit 2 – 5 year olds and 4 – 7 year olds. 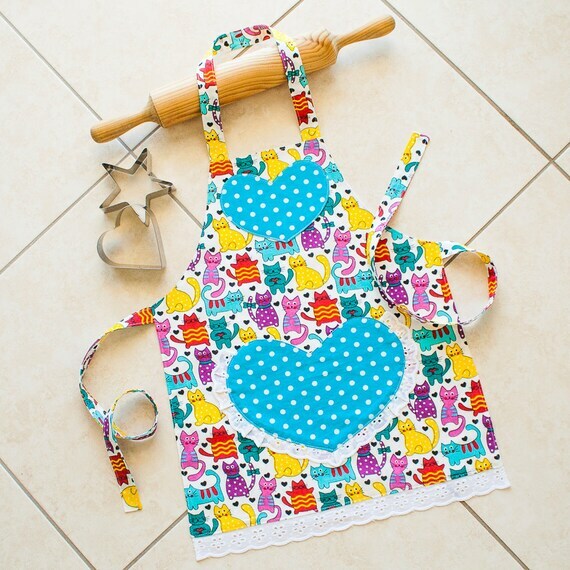 Kids/Toddlers Apron Cats, girl kitchen craft art play apron, cats polka dots on turquoise hearts, child lined cotton apron with heart pocket. They have white spots on a turquoise background for pocket & applique, & jazzy cats ‘n’ hearts for main body. I have added Broderie Anglaise lace for that extra “sweet girlie” look. Also have a lined heart shaped pocket with a little applique heart on the bib. 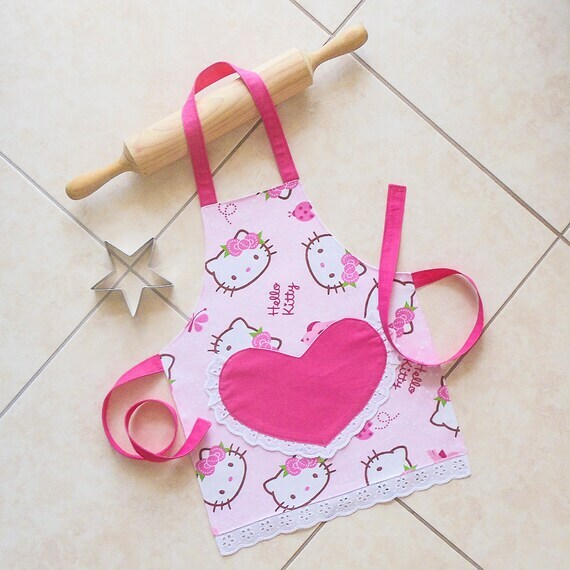 Kids & Toddlers Apron pink, Hello Kitty apron, girls kitchen craft art play apron, lined cotton apron with heart pocket, Kawaii Hello Kitty. “Sugar and spice and all things nice, that’s what little girls are made of”. Spoil your budding chef with these pretty “Hello Kitty” aprons. Perfect for protecting their clothes from sticky fingers and spills. Made from quality, fully washable, lightweight 100% cotton fabric and lined in white cotton. The fabric is pre-washed and seams are top stitched for extra durability. They come with a bright pink “Heart” shaped pocket for all those kitchen utensils and other essentials. I have added a subtle splash of Broderie Anglaise lace for that extra “sweet girlie” touch. Tied at the back with extra-long bright pink ties, they will easily fit 2 – 6 year olds. Care: warm wash, line dry & steam iron. Handmade in a smoke free and pet free home. 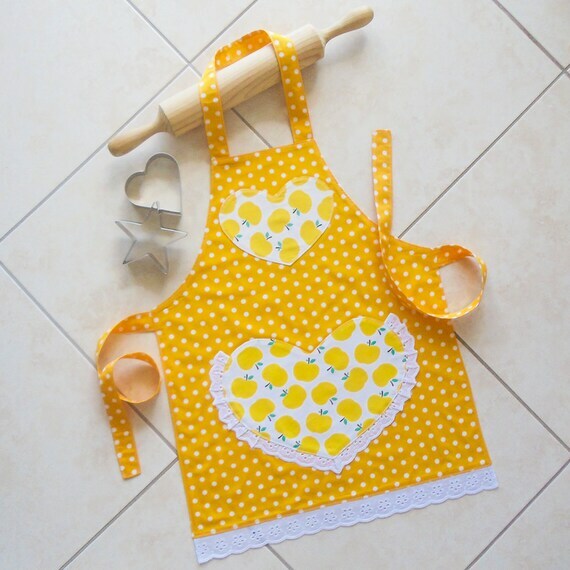 Kids & Toddlers Apron yellow, girls kitchen craft play apron, childs lined cotton apron with yellow apples and polka dots, lace heart pocket. They come in white spots on a yellow background for main body and yellow apples on a white background for pocket and applique. I have added Broderie Anglaise lace for that extra “sweet girlie” look. Also have a lined heart shaped pocket with a little applique heart on the bib.